Suitable for all ages and fitness levels Pilates is a non-impact form of exercise, aiming to improve Joseph Pilates strength, flexibility, posture, co-ordination and body tone. The Pilates Method is a set of principles and movements targeted at the body’s area of core strength- the abdomen and back. Partly inspired by yoga it is different in one key respect. Yoga is made up of a series of static postures, while Pilates is based on setting a posture and then challenging the stability of the body by moving through a range of repetitive movements. It is a movement technique that requires learning fundamentals to build on. Over time with practise participants will learn a concentrated breathing awareness. Pilates breathing helps participants connect to and strengthen their deep abdominal muscles, developing a strong “centre”. Pilates focuses on slow controlled movements, ‘cat like’ as Joe would say, stretching tight overworked muscles and strengthening the smaller muscle groups that stabilise the body and limbs. The aim is to achieve a balanced body with correct body movements patterns, and postural awareness. Concentration of mind helps to develop a deeper understanding of your own body and relieve stress, all in all the intelligent way to exercise! 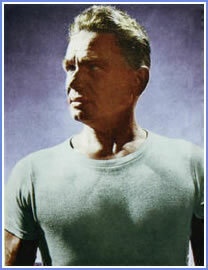 The Pilates Method of exercise was created by Josef Humbertus Pilates who was born in 1880 near Dusseldorf Germany. He grew up suffering from rickets, asthma and rheumatic fever. As a teenager Pilates was determined to overcome these afflictions… and became skilled in gymnastics and athletics and also a student of musculature and body movement. 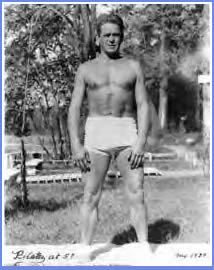 His studies also included Eastern forms of exercise and merging these with his Western Joseph Pilates physiology studies, the Pilates Method was born. Pilates named his method Contrology. In 1912 Joe went to England where he became a boxer, circus performer and a self-defence instructor. At the outbreak of World War 1 Joe was incarcerated with other German nationals as an ‘enemy alien’. During his internment Joe refined his ideas and trained other internees in his system of exercise. Pilates saw injured and diseased companions wasting away and dying simply through lack of movement. He rigged springs to hospital beds enabling bedridden patients to exercise against resistance, an innovation that led to his later equipment designs. In 1918 an influenza epidemic struck England killing thousands of people but not a single one of Joe’s trainees died, this he claimed testified to the effectiveness of his system. After his release Joe returned to Germany where he continued to develop his work and in 1926 emigrated to the United Sates. On the voyage to New York he met Clara a nurse who was to become his wife. Sharing a fascination in health and fitness they decided to open a studio and this is when his teaching became known to the dance world. The method has been very popular with dancers since the 1940’s but is now becoming much better known outside of the dance community. Joe continued to train clients at his studio until his death in 1967 at the age of 87. In the 1970’s Hollywood starsdiscovered Pilates via Ron Fletchers studio in Beverley Hills. Interest in the Method slowly grew over the next 20 years until in the late 1990’s the media began to cover Pilates extensively, again partly due to celebrity endorsement .Since then the Pilates business has become very popular and its followers include not only dancers and actors but athletes, physiotherapists, fitness trainers, health providers and anyone who appreciates the significant role exercise plays in restoring and maintaining good health.